Madeleine Pownall on a 'thoroughly modern online discourse'. I am sat across the sofa from my friend. We’re not talking. Every now and then there is a vibrating ping of a phone, followed by a collective chortle between us. ‘Have you seen this one?’ my friend cackles, as my phone da-dings next to me. We sit pinging and ponging, sending messages backwards and forwards. Although it may look desperately anti-social, we are in fact happily communicating, engaging in a thoroughly modern online discourse – the exchanging of funny internet memes. Memes, a term first used by Richard Dawkins in 1976 to mean easily transmissible cultural units, are essentially viral internet images containing short humorous text. Much like their animated brother, the GIF (graphic interchange format), memes are intended to be created quickly, shared widely, and received humorously. Interestingly, media scholars have published a 'rallying cry and provocation' for further research to be done that explores these unique online social media practices (Highfield & Leaver, 2016). However, psychology has remained relatively absent from this emerging conversation on memeology (a term I just made up), bar a few notable exceptions. Therefore, I wonder how much of this online discourse warrants a more thorough psychological inspection? Indeed, it is interesting to consider what these cultural artefacts may tell us about our social world. In essence, memes have granted internet users a shorthand way of communicating. They are 'fundamental cultural unit(s)' (Coscia, 2013), transmitting pop-cultural and political ideology, strictly under the guise of satirical, often sarcastic humour. When considering their hyper-popularity (a verified ‘Memes’ Facebook page has 15 million online likers), it is perhaps no surprise that researchers have noted a psychological, emotional facet to meme appeal. For example, Guadagno et al. (2013) found that online content which provokes strong affective responses was more likely to be shared. Therefore, it may be argued that there are much deeper psychosocial mechanisms underpinning our relationship with this seemingly benign media form. Kate Miltner (2014) critically considers the popularity of the meme page ‘LOLCats’, offering a more sociological perspective. Miltner examines the psychosocial mechanisms underpinning meme culture, arguing that this 'widespread form of vernacular communication' is so popular because it succumbs to our desire for ‘participatory culture’ in online activity. The idea is that this co-creation of content allows internet consumers to actively engage in an online media dialogue, allowing the previously voiceless members of online society to participate in new forms of humour (Rintel, 2013). There are surprisingly vast links here to some meaty psychological issues, including social inclusivity, constructs of identity, and online power dynamics. Moreover, these kinds of online trends also allow us a unique window into the collective identity of certain participating groups. For example, memes can tell us a lot about how gender and identity are situated in a modern context. Drakett and colleagues (2018) conducted a thematic analysis of the gendered messages transmitted by humorous internet memes. After a thorough appraisal of gendered power dynamics in meme culture, they concluded that critical approaches to online humour enable us to psychologically inspect how it is positioned within rigid power dynamics. Both the content and the acts of sharing, creating, and circulating internet memes is surprisingly personal and political. The political nature of memeology has been explored at great length by media, advertising, and digital communication scholars. For example, Moody-Ramirez and Church (2019) discuss its uses the context of the US presidential elections. These inquiries are important and insightful. However, there is definite scope for a more psychological appraisal of the personal/political tools at play. I find it interesting to consider how, by prescribing to these online ‘idea templates’, we are simultaneously navigating quite complex psychological spaces. Rather than just necessarily exploring how memes work (i.e. what makes them funny and accessible), it may be important for psychologists to investigate the social messages that can be performed and enacted through and with online visual content of this kind. For example, Burroughs (2013) states, in a discussion of meme usage in American politics, that memes can 'serve to heighten spectacle'. In this sense, memes are culturally performative and therefore important psychological artefacts. Indeed, this transmission of cultural ideas in a context of staggering interconnectivity poses some interesting questions and dilemmas for psychology. Our online spaces are complicated and carefully constructed, with memeology being only one of a plethora of new-age communicative methods. I do think that from a psychology perspective, there is more than meets the eye with these seemingly playful images. 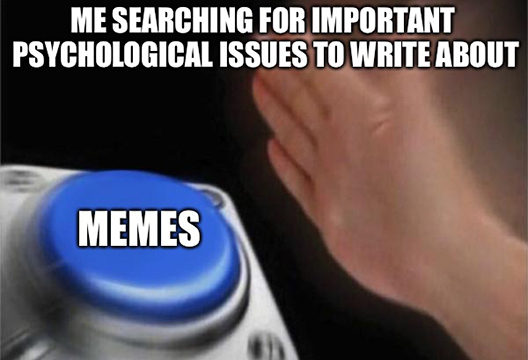 Psychology should therefore turn its attention to answering, what does all of this actually meme? - Madeleine Pownall is a postgraduate student at the University of Leeds. Burroughs, B. (2013). FCJ-165 Obama trolling: memes, salutes and an agonistic politics in the 2012 presidential election. The Fibreculture Journal, (22 2013: Trolls and The Negative Space of the Internet). Coscia, M. (2013, April). Competition and Success in the Meme Pool: A Case Study on Quickmeme. com. In ICWSM. Drakett, J., Rickett, B., Day, K., & Milnes, K. (2018). Old jokes, new media–Online sexism and constructions of gender in Internet memes. Feminism & Psychology, 28(1), 109-127. Guadagno, R. E., Rempala, D. M., Murphy, S., & Okdie, B. M. (2013). What makes a video go viral? An analysis of emotional contagion and Internet memes. Computers in Human Behavior, 29(6), 2312-2319. Highfield, T., & Leaver, T. (2016). Instagrammatics and digital methods: studying visual social media, from selfies and GIFs to memes and emoji. Communication Research and Practice, 2(1), 47-62. Miltner, K. M. (2014). “There’s no place for lulz on LOLCats”: The role of genre, gender, and group identity in the interpretation and enjoyment of an Internet meme. First Monday, 19(8). Moody-Ramirez, M., & Church, A. B. (2019). Analysis of Facebook Meme Groups Used During the 2016 US Presidential Election. Social Media and Society, 5(1), 2056305118808799. Rintel, S. (2013). Crisis memes: The importance of templatability to Internet culture and freedom of expression. Australasian Journal of Popular Culture, 2(2), 253-271.